Are you thinking about quilting? Maybe you’d love to fuel your creative passions by taking up this unique sewing skill? Although you could quilt by hand, and millions do every day and love it, using a sewing machine can speed up the process without compromising the integrity of the final product. If you’re interested in quilting, then take a few moments to read through the best sewing machine for quilting reviews that you can actually use – right here! Some machines are very good and are big time savers when it comes to quilting. Other machines are fine, but struggle to compete with the quality of a quilt that has been hand-stitched. This chart will help you separate the better from the best. What Is a Quilting Sewing Machine and Why Is It Needed? Can’t any sewing machine do quilting? To some extent, every sewing machine can. The best sewing machines for quilting, however, have some unique features that makes them stand out when compared to your other basic equipment. They have wider tables. You need to have a deep width in order to really sew a good quilt and the sewing machines that are designed for quilting accommodate this need with wider and deeper tables for your material. They have customization options. From embroidery to font options and various stitching combinations, a sewing machine that is designed for quilting comes with a lot more options to inspire your creativity than your standard model. Easier to thread. You’ve got to switch up your stitch at a moment’s notice sometimes when you’re quilting. For that reason, the best machines give you the opportunity to change stitches mid-stream and add other custom features that help you create a beautiful, harmonious look. Strong thread tension. If you’re trying to stitch through up to four layers of material, a weak tension on your thread just isn’t going to cut it. The best sewing machines will provide you with a strong enough thread tension to get the job done without breaking your needles or burning out your motor in the process. Do you sacrifice the custom hand-stitching that old-fashioned quilts have when you use a sewing machine? Sure – you do. In return, however, you’ll be able to create full custom quilts more quickly, have consistent stitching, and still be able to do some free-hand work! That’s where our reviews can be a tremendous asset for you. With fact-based information that looks directly at a sewing machine’s features and advantages, you’ll be able to select the perfect tool that will help you create your next masterpiece, whether it’s your own design or one that you’ve found on Pinterest. A sewing machine that focuses on quilting is very similar to your standard sewing machine. Many of them, in fact, can accommodate typical sewing chores in addition to the quilting that you’ll want to do! That’s why it is important to see if you can use a thread spool with a machine or have a good number of built-in stitches, along with other custom, automatic features. You’ll need them in order to accomplish every chore that might come your way. The unique aspect of a quilting machine, however, is that some of them come with embroidery options as well. You can download or install specific patterns that can be manipulated and adjusted for greater levels of customization. Some of the top of the line quilting machines even allow you to customize every stitch within a pattern! The best sewing machines in this category are going to let you press through a quilt quickly while still giving the casual observer the look of a handmade product. That’s because the free arm that is included with many machines will let you include your own patterns and free stitching that show off your individual skills. The best quilting machines will also give you options to adjust your stitching width and the amount of space between each stitch. Width options typically go up to 5mm and some sewing machines allow you to go 7mm between each stitch so you can accomplish a number of unique designs. If you want something that is tight and concise, however, these machines will accommodate you in that regard as well. The best sewing machines are also going to have a top loading bobbin that is pretty easy to load. Just slip it in and pull the thread out and you’ll be ready to start sewing! Look for a clear base that will help you look through to see the bobbin so you’ll know how much thread is left. If your machine requires a custom bobbin that must be wound, look for options that let you do this without affecting the sewing action. You’ll also want to look for a feature that lets you lock the needle in the up or down position. Some entry-level models won’t let you automatically lift or lower the needle, relying instead on your timing. If you’re just starting, that can be a difficult skill to master! The fully automatic needle also makes threading a lot easier and ultimately sewing a lot faster because there is a reduced risk of errors occurring. What Are the Prices of Quilting Sewing Machines? The best sewing machines in this niche are typically about $1,000. These machines will let you embroider with a frame that is at least 4×4” in size while having the additional features needed for custom and straight stitches. You’ll also receive a higher number of built-in stitches that can be used at the upper price point. 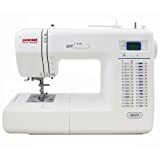 For those who just want to learn quilting or have a few basic needs that need to be met in this area, an entry-level sewing machine can be purchased for about $200. The average price with some of the basic features that you’re going to want for a sewing machine, however, is going to cost between $500-$600. When looking at this sewing machine, there are some features that really make it stand out. 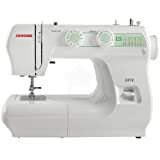 It offers a horizontal full rotary hook that will allow you to blast through your sewing chores without compromising on the quality of the stitch. With a maximum speed of 830 stitches per minute, you will still get a fairly high speed experience without having to pay extra to get it as well. It’s easy to thread, simple to maintain, and will help you create stunning masterpieces in a fraction of time! When it comes to quilting, you may just find that this sewing machine will be come your best friend. It offers a memorized up/down needle stop position so you don’t have to sit and try to time the needle just right on your own when you need to make a change. There is plenty of strength incorporated into the design to sew through thick layers of fabric and the feeder foot helps to move the fabric from the top and the bottom. Even the feed dogs drop so that you can have a polished, quiet, and simple sewing experience! Are you looking for an affordable machine that won’t compromise on the quality that you receive over long-term use? What you may just want is the Janome HD1000! There’s a free arm included so that you can sew collars, pants, and cuffs with ease so that you can complete any project in no time at all. A drop feed is included so that attaching buttons, stippling, and darning is a simple task to complete and an automatic needle threader is included so that you can quickly thread the needle without straining your eyes or your neck to get the job done. It even sews leather! The one feature that really stood out to us with this particular machine was the included Start/Stop button. 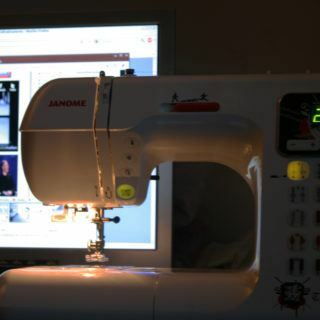 Instead of the traditional sewing methods that require a foot control, this machine can be used on a desktop with just the push of a finger. With just two presses, you can get the unique stitch that you need to get the job done and then go on to your other tasks that need to be completed that day! It also comes equipped with the superior feeding system that is exclusive to this brand so that material won’t gather or bunch up at the needle. With blazing speeds of up to 1000 stitches per minute on straight stitches, you’ll be able to have an amazing quilting experience with this sewing machine. It has an independent bobbin winding system and the system is of a classic top load design. It has a built-in thread trimmer and the delivery system for the thread is vertical in nature. It’s a professional grade machine, powered with a 1 amp motor, and there’s a 9.5 inch sewing bed that’s perfect for your quilt. It’s built to last, even if it may be more of an investment than an impulse purchase! With 50 built-in stitches and 3 one-step buttonholes, it isn’t just quilting that this high quality sewing machine is able to provide. It features a 7-piece dog feed that will let your materials come to the needle with consistency. A locking stitch button is included and you can automatically bring the needle up or down based on what your needs happen to be. The LCD screen with backlighting makes choosing the right stitch an easy task and reverse stitching is possible as well. If you’re looking for an affordable all-in-one machine, this could be the perfect solution you need! With lots of different accessories and all of the basic stitches that you’re going to need, this is the perfect entry-level quilting sewing machine. It’s lightweight enough that you can take it to a quilting class if you want, but it still has good heft and stability to it. 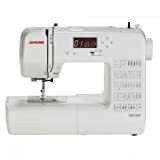 The built-in automatic needle threader is a wonderful addition to speed up the sewing process and a free arm is included with the design for your custom sewing needs. To get started, just turn the dial on the side of the machine to select the stitch you want and you’re ready to quilt! If you’re looking for the best sewing machine possible for those regular household chores, then this is the machine that can do it. It can sew through denim without much problem and can easily be used for mending needs. Curtains, dresses, and even purses are all a possibility with this strong, durable machine beside being able to meet your quilting needs. It’s simple enough for anyone to use, even someone who has never quilted or sewn before, but strong enough that everyone is going to love the results. From an overall standpoint, the Janome 8002D Serger offers the space saving features you want and a quality finish your sewing projects need. If your short on space and want something that is budget friendly, then this is one of the top sewing machines you’ll want to consider today. It’s a little tough to thread the lower loop at times and if you’re off just a little bit, the tension can become troublesome. This can mean broken threads and sewing delays when trying to quilt, but with practice this can become a thing of the past. With a minimal footprint and a lot of strength, this sewing machine has more power than you might expect! Quilting isn’t just something for Grandma to do any more. With the best sewing machine for quilting at your side, you’ll be able to create something stunning in no time at all. Use these reviews to find the best sewing machine to meet your needs and you won’t be disappointed!